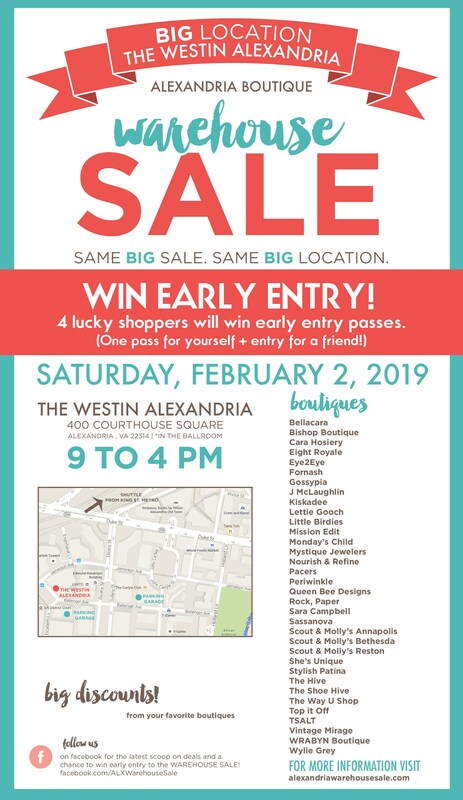 The annual Alexandria Warehouse Sale returns featuring more than 25 boutiques from the city and the D.C. metro area. The event, now in its fourteenth year, will take place Saturday February 2nd from 9AM – 4PM at The Westin Alexandria. Participating vendors include Gossypia, J.McLaughlin, Kiskadee, Lettie Gooch, Mission Edit, Pacers, Perwinkle, Sara Campbell, The Hive, TSALT, Eye2Eye, Fornash, Mystique, Queen Bee, She’s Unique, Top It Off, Little Birdies, Bishop Boutique and The Shoe Hive. This year’s event will include complimentary pilates and yoga classes, hands-on classes for creating custom home decor from AR Workshop Alexandria and a complimentary glitter and mini braid bar from Salon DeZen. Get up to 80 percent off clothes, jewelry and accessories. Doors open at 9AM but savvy shoppers line up early. Those attending the sale can park on the street or at select garages surrounding the hotel for $5. In addition, the Westin is offering a shuttle from the King Street Metro beginning at 7AM.